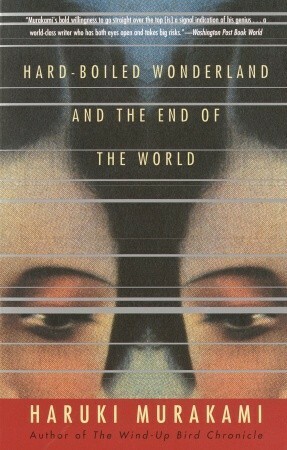 Hard-Boiled Wonderland and the End of the World by Haruki Murakami, translated by Alfred Birnbaum. 1993, Vintage Press. Paperback/Softcover. 400 pages. When it comes to Murakami, I am never entirely sure where to begin my review. There is so much to say, yet also so little that can capture the quality and content of his writing. But alas, I shall do my best. The world created by Murakami in Hard-Boiled Wonderland the End of the World is both familiar and unfamiliar. I always look forward to reading Murakami. His books aren't just ones that I pick up on the fly and read here and there; I almost always wait until I'm not overly busy to read his books, because they have this wonderfully cozy, calm effect that is perfect for those lazy days or breaks from the monotonous events of life. I always feel wonderfully refreshed after finishing one of his books, and Hard-Boiled Wonderland was no exception. Hard-Boiled Wonderland is divided into two narratives. The first of these follows an unnamed man who works as a 'Calcutec' in a somewhat realistic, yet still entirely surreal, world setting. The other is set in a much more surreal, otherworldly setting called The End of the World, where a young man is separated from his shadow upon entering. I'm choosing to not divulge anything further, as you really need to explore it firsthand, plus it would be rather difficult to attempt to explain. This book deals heavily with the ideas of reality, and what one's reality is, whether they are aware of it, and how it influences or doesn't influence their own reality. The two realities introduced above exist simultaneously, and Murakami sort of leaves it up to the reader to determine what similarities or connection may exist between the two. This is a very mind-bending book that plays with the idea of the conscious and subconscious, and the characters within take great interest in playing with the brain and how it works. There are an abundance of heavy and somewhat complicated topics in this book, and the amount of discussions and explanations did actually get a bit exhausting at various points. It wasn't an exhaustion that was a result of boredom of lack of interest, but rather one where I just found myself becoming overwhelmed and I needed to put the book down for a while so that I could clear my head and refresh. Otherwise, the topic became too much for my brain to continue to comprehend - but hey, that could just be me. Murakami's prose was, as usual, wonderfully crafted and calming. Even in moments of what would be perceived as 'high stress,' I can't help but feel calm and relaxed while reading it. He includes countless details that are both important and seemingly unimportant, but they never begin to feel like a drag, and I remained engaged. I actually love the little details of Murakami's writing: his vast music collections and mentions, the in-depth descriptions of food and food preparation, and the quirky and clever actions and words of each character. I would also like to tip my hat to the wonderful translator Alfred Birnbaum who, although I have not read the original, does a wonderful job translating Murakami. Overall, I am giving Hard-Boiled Wonderland four-and-a-half stars for its unique and thoughtful themes and story. I can't say that this has been my favorite Murakami, but it is still a great book that I would certainly recommend.